The growth of the corn-based ethanol industry has changed farming, and nearly everything about farming, including the skylines of small towns such as Elbow Lake. Where once every farm used to have one or two small steel grain bins to store grain after harvest, one million bushel bins anchor grain elevators near major rail terminals now. All because ethanol plants insatiable hunger for corn. One of the companies on the forefront of this explosion is Cross Country Construction from Elbow Lake, Minnesota. Simply put, CCC builds grain bins. They don’t provide the materials for the bins, they provide the labor and expertise for putting these huge, gleaming storage bins up and making them operational. Dan Hengel moved to Elbow Lake in 1993. An engineer by trade he started working for CI Construction .“Grain bins were a big business for them at the time,” he said. Even back then, grain bins were getting bigger and heavier. In 1999, Hengel branched off and started his own company, Hengel Design and Construction, specializing in grain bins. Dan’s son Kris, and his basketball buddies, would work for Dan in the summer. “We started with crews of six,” Dan said. When Kris graduated from West Central Area, he planned to get a degree in Elementary Education. But after receiving his AA degree decided to change his career path. In 2006 Hengel Design and Construction became Cross Country Construction with Dan and Kris in partnership running it. Last year, CCC had 72 people, divided into seven crews, putting up grain bins. They have built in 20 states, Mexico and Jamaica. 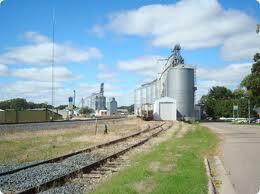 Last summer CCC supplied the labor for the two new 720,000 bushel grain bins put up by Elbow Lake Co-op Grain. The business is coordinated through the office and its three staff people in Elbow Lake. The Hengels have learned to be innovators in the business. As grain bins have grown in size, the way they are built has had to change. Bins, large or small, are built from the top down. In other words, as the top and sides are bolted together, the bin is lifted up using hydraulic jacks that have to be coordinated so they go up at the same speed. “We use house moving technology,” Dan explained. As the bins got larger, and heavier with triple walled steel, more and more jacks were required to lift them safely and smoothly. Eventually large bin builders were employing over 100 hydraulic jacks. But the Hengels developed a new kind of jack that allows them to lift a million bushel bin with only forty jacks. Dan and Kris aren’t home much nowadays, as they constantly travel around the country and beyond, keeping things going. Both were home for a few days in late January, before Dan flew off to Arizona to supervise a project for a huge feed lot. Kris headed out to Memphis, Tennessee a few days later to supervise a crew building some new bins at a barge loading facility near the Mississippi River. Cross Country Construction crews travel with a fleet of eight dually pick-up trucks and utilize sixteen semi trailer to carry the jacks and related equipment. You will always find someone at the office helping to coordinate the business operations in downtown Elbow Lake, MN. To see some photos of their jobs you can find them at www.cccbins.com/projects.